The higher education minister also announced a bursary scheme for students whose parents earn less than R350 000 a year. Higher education and training minister Naledi Pandor today highlighted student funding as a major barrier to student success and announced a full-cost bursary scheme. 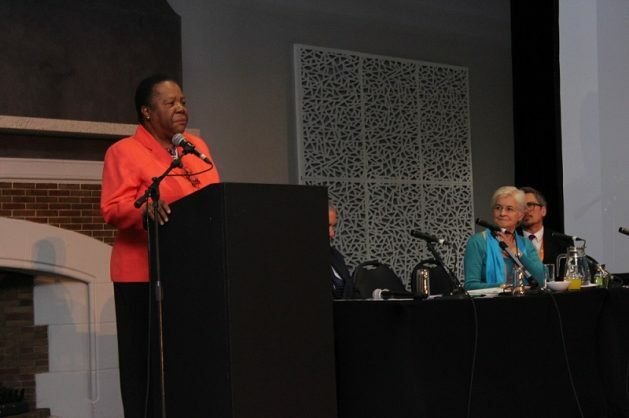 Pandor was speaking at the 2018 Siyaphumelela Conference, taking place from June 12 to 14, at the Wanderers Club in Johannesburg. Non-profit organisation Saide said the three-day event would include a number of workshops with presentations and discussions centering on finding solutions to why students do not succeed at institutions of higher learning. Saide offers a number of services across all educational sectors and works with educators, programmes and institutions as well as government to enable successful open learning for all. Pandor opened the conference and highlighted the adverse effect student funding had on South African students. Saide said the annual conference was a central aspect of the Siyaphumelela programme that was aimed at improving capacity at South African universities to use data analytics to improve student success. As such the annual conference aimed to promote a national discourse on student success initiatives of the Siyaphumelela programme. Bill Moses, managing director of the Kresge Foundation, the funder of the conference, announced that the foundation would extend support for the initiative for the next few years. “We need models of funding that fully support students and their needs. With student success, there is no magic bullet. No one consultant, one app, one solution. Student success has to be an approach — not a priority but the priority,” Moses said. International guests in attendance included Professor Sara Goldrick-Rab (Temple University, Philadelphia), Chancellor Kim A. Wilcox (University of California, Riverside) and Vice Provos Sukhwant Jhaj (Portland State University, Portland). Saide said as the only conference focusing on the use of analytics to promote student success in sub Saharan Africa, the conference provided a platform for international and local experts and practitioners to discuss evidence-based practices and national systemic interventions aimed at student success. Other key people in attendance will be the VCs and DVCs of the five partner institutions which include the University of the Witwatersrand, the University of Pretoria, Nelson Mandela University, the University of the Free State and the Durban University of Technology.